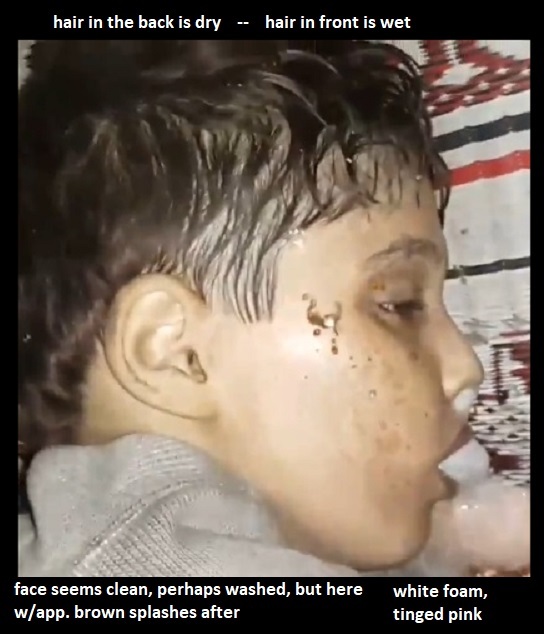 Why the Douma victims had such clean faces and wet hair may not seem like an important question. But it is. Did they all think the best solution was to remain breathing the gas, so they could wash their faces and hair before trying to flee? It seems like a strange response, but many - and perhaps all victims here - seem to have done this. Here's a boy seen next to the same sink on the second floor (he and Hamza are the only males out of 12 bodies on this floor). His face isn't totally clean now, but his hair was recently very wet, in the front but not the back. Since then, he's emitted thick white foam, here tinged pink with blood, and it seems ha had some brown liquid dribbled on his cheek - or perhaps this is a dark stain, to go with the lighter ones across his cheek and round his eye... or this is all from after washing ... hold that question as we look at other cases. Timeline issue: images of these victims first appeared around 11pm . This is hours after the alleged gas attack at 7:30 pm by most accounts, or maybe sooner after an attack at 9:00, or 10:22 PM, as others claim. This matters when we see so many wet heads around 11, and so many saying the gas was released at 7:30. This boy has a face that looks dirty (especially in other/later views), but I've established this is some kind of stain and/or burn that remains after a later washing. The color similarity suggests the yellow-brown fluid coming from his mouth caused this, rolling up his face and around his eyes (but not right in them), as his head was angled that way. This would be protective mucous perhaps, and/or the poison that triggered it - either directly caustic, or reacting with chlorine gas to irritate the skin. It would get across his forehead too, but would roll across quickly. Then, it would drip from there, or pool in his hair before dripping down, depending. But now, all that's left of that is the stain and skin irritation that fluid caused. And as this early view shows, his hair was recently wet, still sticking in clusters to his forehead. Several other share these same signs, a mask pattern on the upper face except the eyes, consistent with being bound upside-down, coughing caustic yellow fluid up their faces, but with eyes usually protected by goggles. (see Douma's Mask of Death) This sounds bizarre, and it is. But it would explain the weird patterns left, and could also be the reason for the washing mystery: faces, foreheads, and hair at least in the front, are all places that fluid would go. It would look strange, perhaps too obvious a clue of how the people really died. By the time they show us the bodies, the fluid isn't seen, just stains and other signs. And those areas have been washed, as if to remove that evidence. Here, we can see the boy's yellow staining of his cheeks apparently survived two washings; as found in the house, he has recently-wet hair sticking to his forehead, and new fluid leaking out, besides the thick white foam. 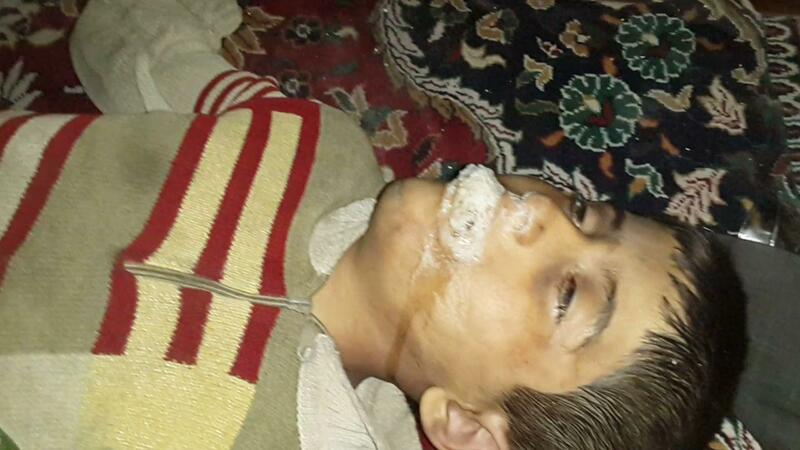 This boy seems to have the strange story, as do several others, perhaps over half the victims we see. The dirty or sooty hands are NOT a clue. Apparently everybody in Douma, of all classes, has black-gray-stained hands that never come clean. So this cannot be a clue to any conditions specific to their story. But A majority of the victims (both of those above) have filthy pants, as if worn for weeks straight without washing. Some have shirts to match, but many have fresher, cleaner shirts they changed into perhaps days before. The women's universal long coats and hair coverings tend to be clean, even immaculate, maybe kept in storage until the end. But the clothes we can see underneath tend to be as filthy as any, even on the pregnant woman. Shirts but not pants can be washed or changed? And that face and even hair washing was a priority at the moment of death? For the women, maybe the hair washing was skipped. This woman with the clearest brown mask pattern apparently had the original mucous stuff washed off. As with the boy above, this left just the stains behind. As with all head-covered women, we can't say if her hair is wet too. 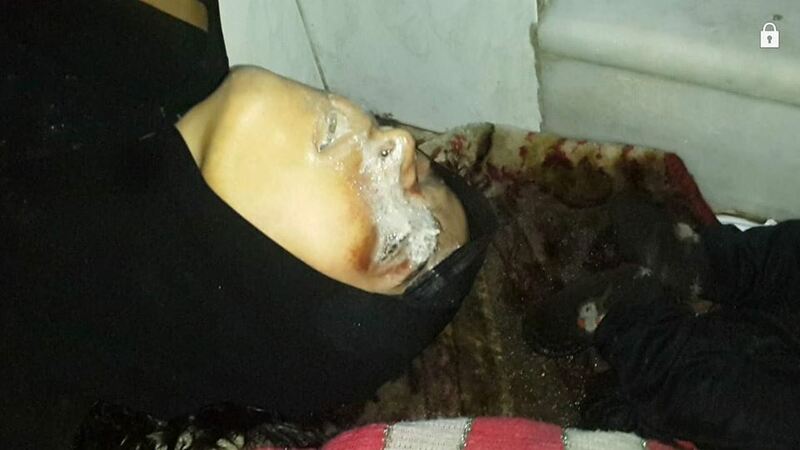 Perhaps she was covered during the gassing, but not likely with this same fabric, which doesn't seem stained. The white foam came after this, and that has gotten on her hijab a bit. Perhaps her hair is full of caustic yellow mucous, just covered up to save on washing time. Six more examples: out of several more: victims with wet hair when found supposedly right where they fell, hours after the alleged attack by most accounts. Some short-haired male victims, and babies with fine, easy-drying hair are less clear. And as noted the women all wear hijabs or hair coverings. Considering all that, it seems possible that everyone fits the pattern. Of the 35 victims seen on video (of a reported 35 total found), I see 13 clear cases of wet hair - more than 1/3 of all victims. 9 women/girls with hair covering making it unclear, and 13 others aren't clear at the moment for different reasons. Did they wash up before they laid down to die? Or I suppose it's more logical to presume this happened in bulk sometime after death. Did some other rescuers come through some time before the first camera crews, and - rather than rescue them - just wash everyone's faces? That alone would be a rather strange thing to do, and no one has suggested it. 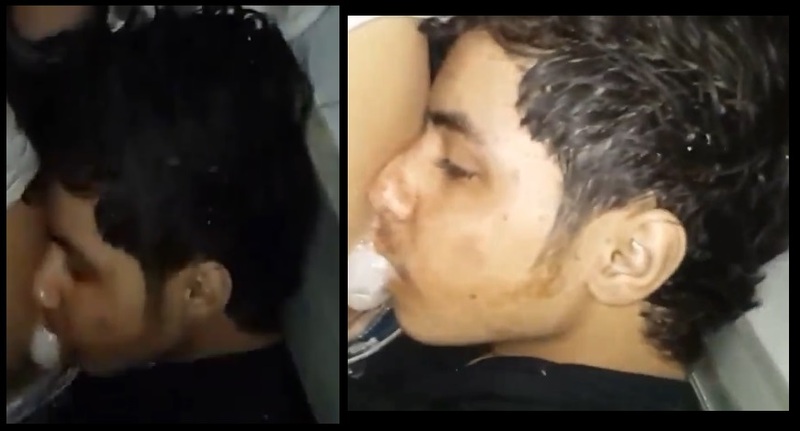 Instead, Naser Hanan's story has at least one victim washing himself off. And as some have noted, the largest number of bodies is piled up in front of the shower on the first floor, as if rushing to wash themselves rather than trying to escape. <add 5-16> Thanks, Andrew for the tip: A bizarre article in the Times of London (April 10) heard from "Abdullah Abu Homam, a local volunteer" that this batch of people is a discrete family unit who died just that way. "The entire Bakrieh family in Douma were found in a heap on the bathroom floor. 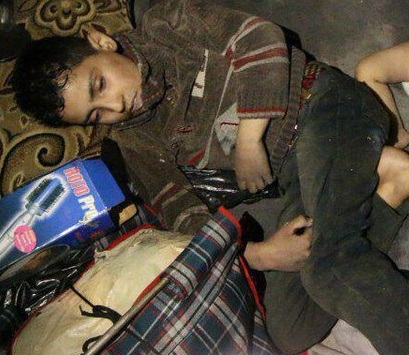 After a gas bomb tore through their building, the parents had tried to scrub the chemicals off their children’s skin. 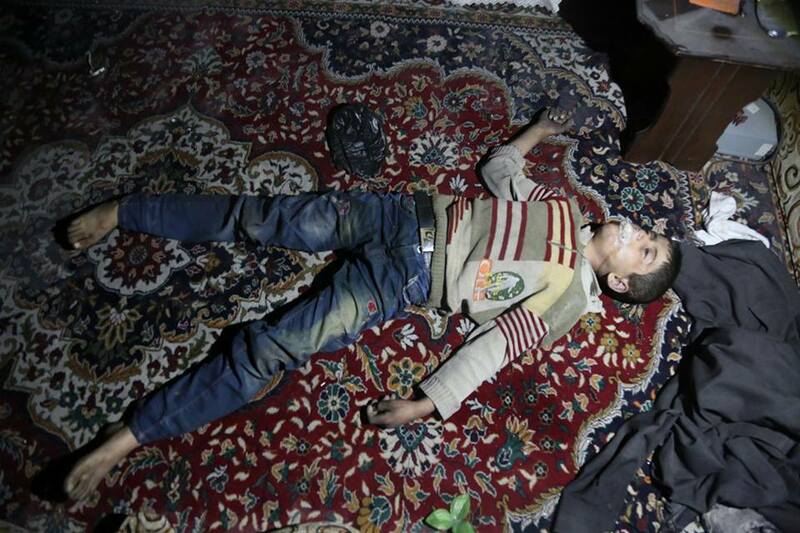 But the toxic cloud overwhelmed the family of 11 before they could protect them." As Abu Homam is quoted: “When I entered the flat they were all in the bathroom, their clothes were still wet so we believe they tried to rinse themselves in vain. Eventually they must have realised it was over so they drew closer together and died." Why they never tried getting away from the toxic fumes is unexplained. It's stay in and wash it away, or hug each other in a big pile and call it a life. That's plain stupid. Videos and photos show 12 bodies in the bathroom at the first views. One woman here, being pregnant, is probably the one claimed for another family (allegedly married to Khaled Nuseir). Excluding her, we would have 11. Records list exactly 11 people named Bakriyeh, but with infants, there must be wives, and most women here keep father's names, and won't be in that list of 11. The exceptions are exceptionally "modern" and Western-oriented people, and mainly Christians. Or was this such a family? 4 males, 5 females, 2 unclear infants are seen, compared to the VDC's 5 male, 6 female. Is this a whole family of 11, all named Bakriyeh? Did they really pile themselves here, or were they just dumped and arranged together? Anyway...As for the other 7 people just steps away, who also tend to have wet hair. Are these members of a neighbor families who went first, in a one-family-at-a-time bathroom scrubbing system? two girls just above the 2nd floor, and an older woman (more like their grandmother) on the ground floor. At the time, Abu Homam said that all of them had damp clothes. In the images I see, some clothing is faintly moist (some damp crotches of jeans), but most is not. Maybe they were given a full body wash before this guy saw them. But later on, that's mostly dried up and the victims' hair is the wettest thing, a most-recent concern, maybe not even after Abu Homam left. Or for all we know, he was the guy who washed their faces and hair, taking care to mention self-washing as the explanation for that. But his account may help us see that it happened in at least two phases, and probably all done to the victims, not by them. Here and everywhere there's little if any sign of such rinsing to their hands, bodies, or clothes, which appear dry. It's just the face and hair someone had to clean up. Why? How does that make this girl safe to handle with bare hands after a chlorine-nerve agent attack? It doesn't. Note, White Helmets guy, not rescuing here: he moved her from another spot, photo op with her body in front of the shower, then sets her at his feet and leaves. She's removed with the rest in the morning. The absence of the staining fluids on stained parts of the face had alone suggested face-washing. Also, it seemed some had wet hair. Now I see most have those signs and so, again who washed the victims' faces and hair so widely, presumably after death? And why? I propose it was the killers and stagers, who brought the victims to this abandoned home from another, nearby location where they were gassed, largely upside down. I doubt it was the basement here, as that's shown and is not full of yellow goo and blood stains, and there seem to be no hooks in the ceiling nor rafters to hang people from (I don't suppose those things are truly necessary to explain the case, but I suspect they were fully dangling like that). 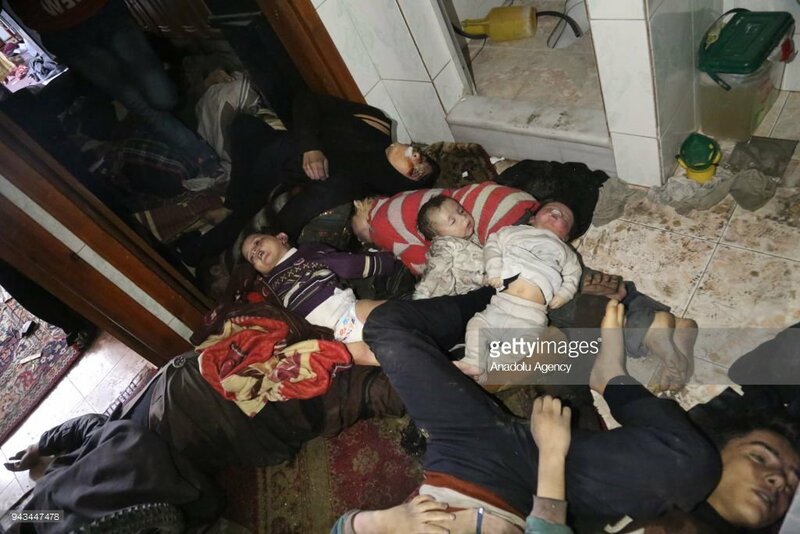 Either at the gassing facility or at the home they were dumped in, it hardly matters, the ugly, telltale residue was rinsed off their upper faces and hair. It seems likely this was done at the staging site, as a last-minute decision, just shortly before the first images were taken. That proximity of events suggests the reason for the washing was not to help or save anyone, but to make the propaganda images somehow look better, more marketable.. Maybe they were trying to wash away the signs of the truth - a false-flag gas chamber massacre of captive civilians, including babies. Other Douma residents have to get their water from out in the street -so going to the bathroom to 'wash off the gas' is in the context of very possibly having no water on tap. If they are local families and the witnesses genuine surviving neighbours, I'm not sure why any are missed or unidentified. And then why activists can trust the hospital to treat alleged living victims but have to hide anyone they think may be dead? Seems a contradiction. Douma CW Massacre, First Thoughts, etc. Did Liwa al-Dawoud Kidnap James Foley?